Google’s big hardware event for the year has finally arrived, and we’ve been treated to a slew of great new products from the company – including the all-new Google Pixel 2 and Google Pixel 2 XL. Those devices, however, weren’t the only new products from Google on display October 4 – in fact, the company introduced a number of devices under the “Made by Google” umbrella. On top of the new products made by Google, Google also recently unveiled its device partnership program, called “Made for Google,” which promises to showcase a ton of new products built specifically to work with Google devices. But what exactly define the “Made by Google” and “Made for Google” programs? And what kinds of devices should we expect to see for each? Here’s everything you need to know about the two major arms of Google’s big hardware push. The Made by Google program is pretty straightforward – it simply includes any devices that are literally made by Google. In other words, if a device was designed and created by Google and is being sold with Google branding on it, it’s in the Made by Google series of products. Of course, that doesn’t mean that Google manufactures all the products in the Made by Google program. Instead, it means that the company played a major role in designing and developing the device. So much so, that Google is willing to brand the device with its own seal of approval. The majority of products in the Made by Google program fall into the major device categories like phones, laptops, smart home devices, and so on. 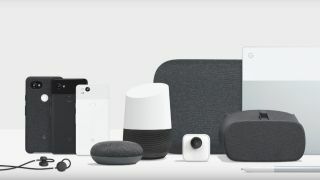 Google largely leaves the accessories to the “Made for Google” program, where it promotes products that can be used in conjunction with its own. Made for Google basically covers all the Google-related products that Google isn’t building itself. The vast majority of these products will be accessories: cases for your phone, chargers, headphones, and so on. The main difference here is that the products won’t be branded as Google-built. An Otterbox case for the Google Pixel 2 XL may be “Made for Google,” but you can bet it’ll still say Otterbox on it. That doesn’t mean that Google isn’t involved in the product at all. In fact, that’s the whole point of the “Made for Google” program – it’s built to allow Google to recommend products for its devices. What that means is that you know there’s a certain level of quality in the building process. Google is likely taking the certification pretty seriously, and will only allow for a product to fall under the “Made for Google” umbrella if it meets certain standards – so, if you’re looking for a case for your phone, you’re more likely to get a quality one if you buy one that’s Made for Google. On top of these main products, Google also offers a slew of accessories, like phone cases, bases for the Google Home, and so on. Since these are actually made by Google and not just recommended by Google, they fall under the “Made by Google” category. Not seeing anything of interest? The Made by Google program will only expand. Not only is it most likely that Google will launch more phones in the near future, but it’s clear that Google is looking to take on Amazon with the Google Home series. On top of that, considering Google’s recent acquisition of a large portion of HTC’s smartphone business, it’s possible that Google will expand its smartphone lineup to include more phones across different price points. So where can you get Made by Google products for yourself? Well, the main way is through the Google online store, which you can find here. There’s only a small list of categories currently part of the “Made for Google” program – but that list is likely to grow in the near future. On top of these accessories, Google also sells a number of dongles and adapters for its phones and devices, made by companies like Belkin. You might notice something about this list – it’s mostly accessories. But that’s kinda the point of the “Made for Google” program: It’s aimed at offering products that work well with products that Google already offers, not at recommending products that might compete with what Google offers. Both the Made for Google and Made by Google programs are in their infancy. Google is only recently transitioning into a company with a major hardware arm, and we’ll see more and more Google-built products over the next few years. Of course, we’ll also see more products made for those Google-built products – so expect the Made for Google program to grow a lot in coming years.